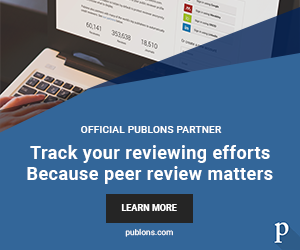 Philip Salmon and his team at the University of Bath take us through their recent Open Access Journal of Physics: Condensed Matter paper investigating rare-earth clustering in sulphide and selenide materials. Read the full article here. The difference functions measured for glassy (R2S3)0.07(Ga2S3)0.33(GeS2)0.60 (R = La or Ce) by using the method of neutron diffraction with isomorphic substitution of the rare-earth element. Here, diffraction patterns were measured for two glasses that are identical in every respect, except that one contained La and the other contained Ce. The nuclei of these elements scatter neutrons differently. Hence, by subtracting suitably weighted combinations of the diffraction patterns, it’s possible to gain site-specific information on the coordination environment of either (a) the rare-earth element, where the peaks at ~3.09 Å and ~3.86 Å originate from the R-S and R-Ge/Ga nearest-neighbours, or (b) the “matrix” atoms (Ge, Ga or S), where the first peak at ~2.24 Å originates from Ge/Ga-S nearest-neighbours. The experiments were made using the diffractometer GEM at the ISIS neutron scattering facility. Figure adapted from J. Phys. : Cond. Matter 29 225703. © IOP Publishing. Chalcogenide glasses contain one or more of the elements S, Se and Te, and are ideal hosts for luminescent rare-earth ions. Here, the transition of electrons between the 4f electronic energy levels of a rare-earth ion can be exploited to make photonic glasses, with applications such as lasers and fibre amplifiers that operate at wavelengths compatible with fibre communications technology. Optical amplification is crucial for making practical devices, i.e., it is desirable to optimise the population of excited electrons so as to promote a large population inversion by stimulated emission. The so-called fluorescence lifetime of electrons in their excited state is influenced by the electromagnetic interaction between rare-earth ions, i.e., it is better for these ions to be well-separated and not clustered. Our team at the University of Bath has developed methods for untangling the structural disorder that’s associated with glass, with the aim of developing realistic structural models that will lead to the design of novel amorphous materials. 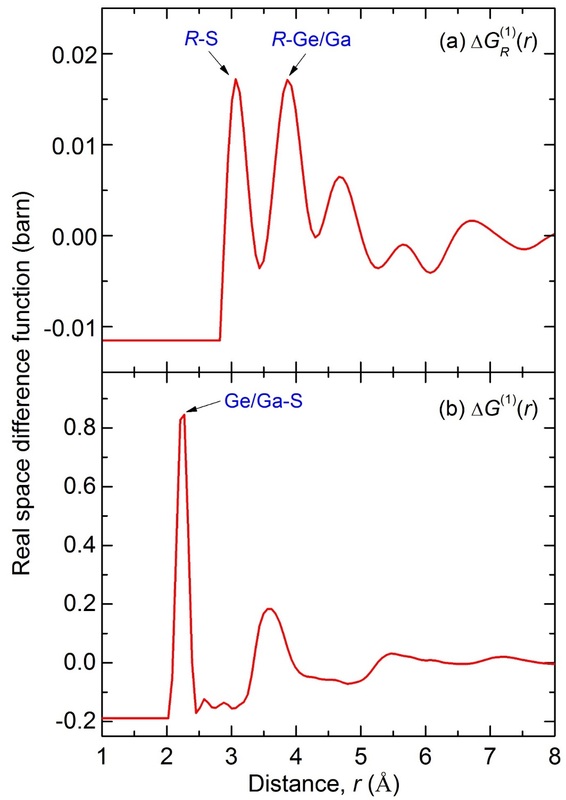 For the case of rare-earth chalcogenides, we decided to explore the structure of glassy (R2S3)0.07(Ga2S3)0.33(GeS2)0.60 (R = La or Ce, X = S or Se) by using a combination of neutron and x-ray diffraction. In particular, we exploited the structural isomorphism between La and Ce to gain, via neutron diffraction, site-specific structural information on, e.g., the nature of the rare-earth coordination environment. This feature of our work is important because the glasses contain several different components which increases their structural complexity. Ga2X3 is added to the base glass GeX2 at the same time as R2X3 in order to increase the rare-earth solubility and reduce the extent of rare-earth clustering. 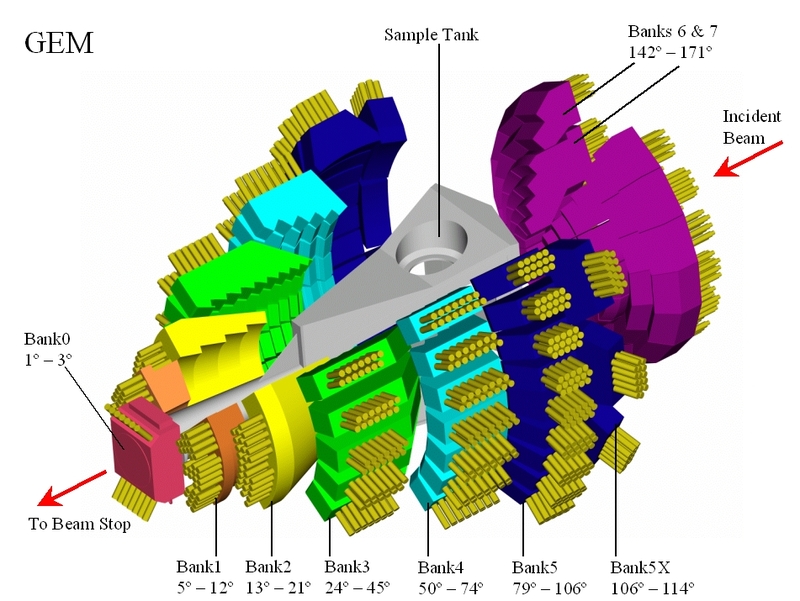 Schematic of the GEneral Materials (GEM) neutron diffractometer at the ISIS pulsed neutron and muon source. © STFC. Our results show glass structures that are based on networks built from tetrahedral GeX4 and GaX4 units, in which the rare-earth ions reside with an R–X coordination number of the order 8 – 8.5. The positive charge on the R3+ ions is balanced by the negative charge on units such as GaX4–, where the charge on this unit is calculated on the basis of a Ga3+ ion that is surrounded by four X2– ions each of which is shared between two nearest-neighbours. In both the sulphide and selenide glasses, the rare-earth ions are clustered via R–X–R connections to give minimum nearest-neighbour R–R distances of the order 4 – 4.5 Å. All of this information will underpin the construction of new models for rare-earth chalcogenide glass. James Drewitt graduated with a PhD from the University of Bath, and went on to postdoctoral research positons at CEMHTI-CNRS (Orléans) and the School of Physics and Astronomy at the University of Edinburgh. He is presently a Senior Research Associate in the School of Earth Sciences at the University of Bristol. Phil Salmon graduated with a PhD from the University of Bristol, and went on to a Research Fellowship in the Department of Physics at the University of Exeter, and to a lectureship in the School of Physics at the University of East Anglia. He is presently a Professor in the Department of Physics at the University of Bath. Anita Zeidler graduated with a PhD from the University of Bath, where she remained as a postdoctoral research assistant. She is presently a Royal Society-EPSRC Dorothy Hodgkin Fellow in the Department of Physics at the University of Bath. Chris Benmore graduated with a PhD from the University of East Anglia, and went on to a postdoctoral research positon in the Department of Physics at the University of Guelph. He then became an instrument scientist at the ISIS pulsed neutron source of the Rutherford Appleton Laboratory, before moving to the Intense Pulsed Neutron Source at the Argonne National Laboratory. He is presently a Senior Physicist at the Advanced Photon Source, Argonne National Laboratory. Alex Hannon graduated with a PhD from the University of Reading, and went on to become an instrument scientist at the ISIS pulsed neutron source of the Rutherford Appleton Laboratory. He is currently responsible for the science programme in disordered materials on the GEneral Materials diffractometer (GEM).